Edible pumpkins, there are about 100 varieties. It can have round, pear, oval, turbanado and other form. The color of the fruit is also diverse. To be able to consume all winter this vegetable, it is necessary to correctly plant and grow. 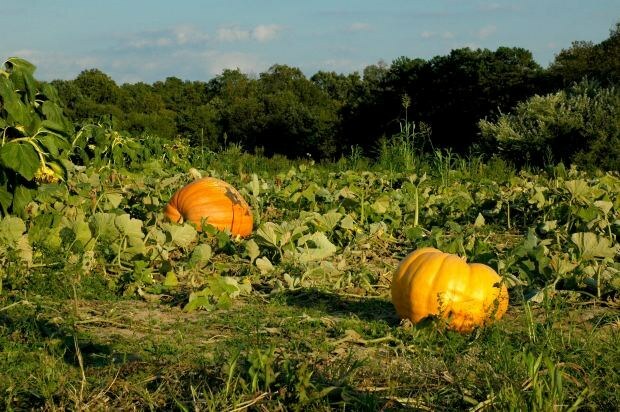 Pumpkin is valued for its curative and taste. It is used in porridge, soups, juices, salads, fritters, casseroles and even jam. You can use the pulp in cooking, and solid border: the border attribute for Halloween. Then you need to plant varieties are round in shape with yellow or orange color. If you want to impress coming to the house of the people, put the pear-shaped variety. Like many others, he dolega until spring at room temperature, if to lay in store undamaged fruit. In such instances, you can decorate your home. If you want to get an early harvest, plant seeds seedlings, and subsequently her in the open ground. Pumpkin needs to grow home to not more than 25 days, otherwise the seedlings will stretch, so start pre-sowing seed treatment a month before the end of spring frosts. In the middle lane start etched in potassium permanganate from 20 to 25 April. Make the solution weak. Vsypav 3-4 crystals in 100 of water, stir it. Then put the pumpkin seeds for 20 minutes. Then rinse them and put them to be enriched with nutrients. This requires a bandage and the bowl. Wrap the seeds in a double layer of bandage, put it in a container, pour a growth stimulant. After 10 hours, drain it, put in a bowl for a day in the fridge. After this time, keep the seeds wet day in the bandage at room temperature. Then plant each seed in a separate pot of nutrient mixture, it is better to use peat. Not preobladaet the earth, grow seedlings on a bright window sill or the balcony at a temperature of +15+20 ° C, then it won't be extended. In late may, seedlings of pumpkins planted in the open ground. If you have no opportunity to grow seedlings, you will have time to obtain large fruit, planted seeds directly into open ground. The optimal time to do this, may 15-20. Start to germinate seeds offered above by the way two days before planting. This culture, like all members of the Cucurbitaceae family, loves to grow in light soil, rich in organic matter. The latter can be decayed. The area under the pumpkin to cook, to avoid unnecessary effort, start digging from the middle of the ridge. When you do this, take some land, put it in the left and right side. You'll have a trench width of 60 cm, Place it in grass, dry leaves, decayed compost, manure. Per meter square place 2 tablespoons nitrophoska. Mix it all with a shovel. Top cover with land, which lies on both sides of the trench. Pour a bed of warm water. Plant seeds of the pumpkin square-cluster method in 2 rows 50 cm Cover the top non-woven material. If the weather is warm, the first shoots coming up in 5 days. If cool, will have to wait 7-9. Then, remove the non-woven fabric, water occasionally, slightly loosen the top layer, watering as needed. On each hive, leave no more than 1-2 of the ovary, then the fruits will grow larger.